This entry was written by my friend, Mike Donohue. Thank you, Mike, for sharing your voice. 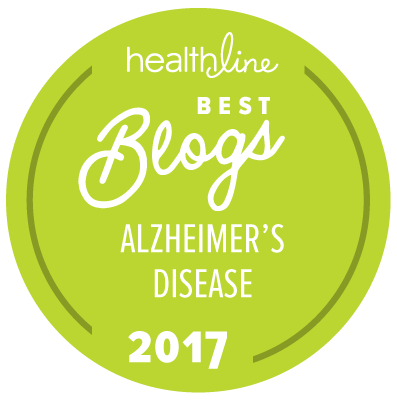 I was diagnosed as having Alzheimer’s Disease. This is the worst possible diagnosis I could get, short of suffering a crippling stroke like my Dad or losing my eyesight. As I pass from conscious connection with Alzheimer’s, I am told I will not know what is happening. The pain of it is suffered by those loved ones around me. None of this spares me the pain I will visit on my wife: robbed of a partner in exchange for a ward and charged with the effort and the cost of caring for me. I am saddened for my children. I will likely not experience their progress in life, nor growth of my five grandchildren I now have and any more that may come. I will probably not be around or lucid if I am for their weddings and births of my grandchildren. Although initially devastated by the diagnosis, I quickly arrived at this way of thinking about my diagnosis of Early Alzheimer’s. I believe that things happen according to a plan. Whose plan? I do not know. My plan set in this lifetime it is not! Whether it is mine devised somewhere else, the plan of my higher power, or what, I have no idea. It is a plan followed by me in spite of me, taking me often into places and directions I would rather not be. Much of it has been painful. As I learned in Alcoholism, learned before recovery and learned after recovery, I am the better person for having experienced where I have been taken. It all turned out as it ought to have. All of the events have tied together in a definite pattern. I can see this now, realizing it retrospectively. It is seen in the serenity of my senior years which has been one of the best things about growing old. I no longer have challenges to meet, I have met them and my serenity is the result. I have also known I was not finished. I hoped I was finished but knew I was not. I wondered what was yet to happen. It has been my view that I have not done as much for my family, my fellow man, my world, as I should have. I was troubled that I was not doing in this arena, saw others that were, and felt empty in my self in this regard. When I thought about it I reasoned, if I really believed I was living a plan, if my attitude was willing, the right thing for me to do would come along and I would do that. Although I wondered whether or not I was shirking or just fooling myself, the times I considered this, I was prevented by one circumstance or another from going right out and getting something started. It was in this that I at least felt a little peace about it. When at peace I would think, I wonder what my next undertaking will be and when it will present itself. I honestly believed that and found serenity by relying on that. I believed I would fulfill the rest of my life with something more that would be meaningful for me. I would find something with which I could leave at least a little mark having helped others. On June 29th, 2006, I learned what my next challenge is. It was in the doctor’s office when it presented itself. I have Alzheimer’s disease! It was presented to me then and there! What I do about it will be my measure of my last days. I have five to eight good years to find that out, maybe ten or twenty years if I am lucky. I pray to my Higher Power that I have the strength, the fortitude, to make the best of this time. I further pray that I may leave a mark because of this.